Yes, I made it sure; it’s not there, nowhere in my drafts or even in any of my cheat sheets. Hmm...How did I miss it? I was looking for my Prawns Curry recipe I used to make. In fact it was one of the first fish/shell fish curries I made by following my Mom's direction. I never liked the taste of fish when I was young. There were only few I liked and prawns were one among them. When I started cooking, I knew that the easy peel shrimp you get here is the one to go for. My first attempt of prawns curry was not a success. I don't think I remember the count of failures, but later on I managed to get it hit the spot and I used to serve this for any get together in my house. The interesting thing about this recipe is that I never made a note of this anywhere and I haven't made this curry for a while now....I am talking about years here. Last weekend my parents came back from India after their vacation and their elaborate stories of food they enjoyed there was overwhelming for a foodie in me and it reminded me of this delicious curry and I was determined to make this curry. But my search for this recipe in my folders was vain. I had to dust up my memory to make it again. It was all coming back. I felt like I found a long lost friend of mine after making it!! Please don't get intimidated by the ingredient list, it's not that complicated to make the curry. Wash the Tamarind and soak them in 1/2 cup warm water and keep it aside. Wash the prawns/shrimp in cold water and keep it aside. I use either turmeric water or lemon juice to wash the fish to remove the fishy smell. In a pan heat 1 1/2 tbsp oil and sauté shallots, ginger & garlic paste with salt till they are light golden brown color. Keep it aside to cool. Grind this mixture into a smooth paste with 1/4 cup water. In the same pan, add 1 tsp of oil and roast the chili powder, turmeric powder, fenugreek and asafoetida on low flame till the raw smell is gone. Now add the ginger garlic shallot paste and cook for 2 minutes till the gravy gets into a thick paste. Turn off the flame. Take a earthen ware or non stick pan to cook the curry. Add 1 tbsp. of oil and splutter the mustard seeds. Add the cooked masala to the pan, followed by tamarind plus the water in which it was soaked. Add 1 cup of water and adjust the salt. Now add the shrimp/prawns and coconut slices to the pan. Add the curry leaves and close the lid of the pan. Cook the shrimp on low to medium heat till the gravy starts to thicken a bit. Now add the coconut milk and cook for another 2 minute on low flame. Add 1 tsp. coconut oil on top of the curry and turn off the flame. Garnish with some fresh curry leaves. Let the curry sit for 10 - 15 minutes before serving. As it cools the gravy will become thick. 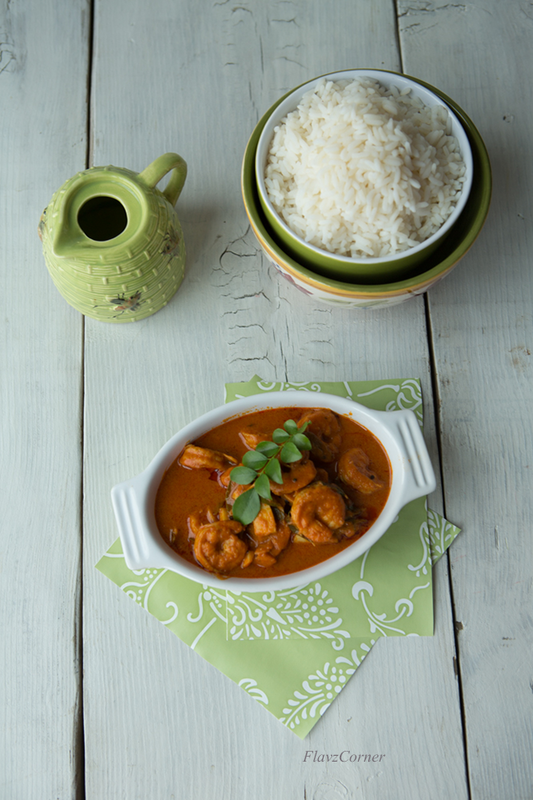 Serve the Spicy Kerala Style Prawns with plain steamed rice. Fish Tamarind is something you can get from Indian stores. Adding the regular tamarind paste can ruin the color of the curry. Even though I highly recommend Fish Tamarind for this curry to get the authentic taste, you can substitute it with 4 to 5 tbsp. of thick tomato paste. You can increase/decrease the amount of water depending on how you want your gravy to be. You can increase/decrease the amount of coconut milk. I like fish curry to be spicy, so I didn't add more coconut milk. Adding more coconut milk will bring down the heat of the curry. You can also adjust the amount of chili powder and Fish tamarind per your taste. 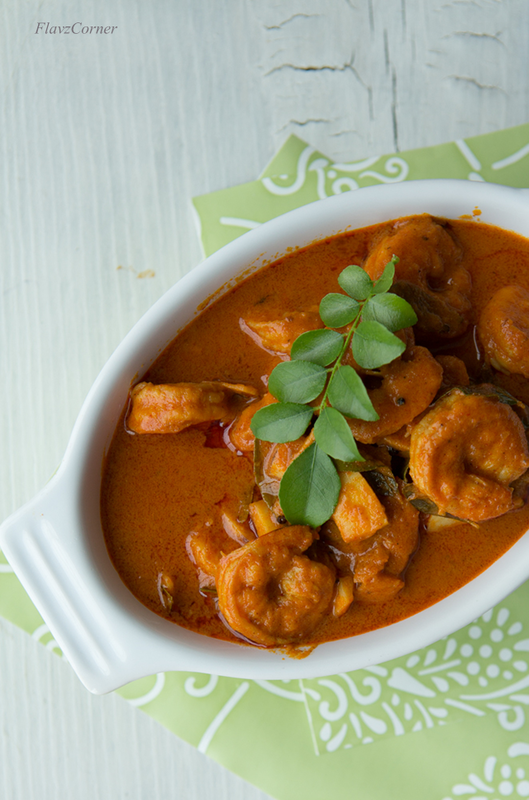 Prawns curry with coconut milk looks yumm and I know it is finger licking .. Fish tamarind is gambooge, something I too learnt from blogging. Curry is definitely one of the best winter treats. This looks so flavourful and tasty. I hate it when I can't find (or exactly recall) a recipe! One of the reasons why I started a blog -- so I wouldn't forget! Anyway, this is wonderful -- really fun flavors. And I love shrimp in this sort of sauce. Good stuff -- thanks. too tempting clicks,am feeling hungry after dinner now..feel to dig in the prawns curry with some steamed rice,yummy!! That's an awesome looking curry. Absolutely love it! 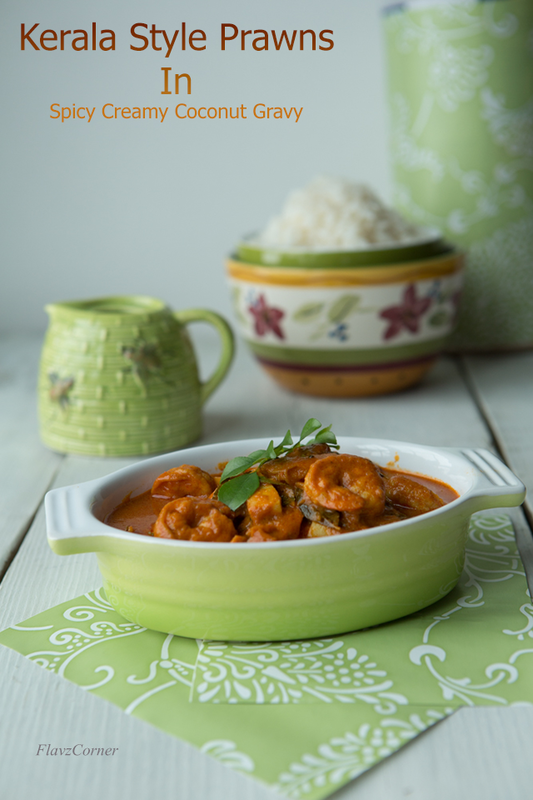 Can never live without a delicious kerala style prawn curry!